A leaflet from Offaly based Independent Councillor John Leahy from the 2011 General Election. He polled 4,882 votes. He polled 2686 votes in The Local Elections topping the poll in Birr. He was in the news recently for speaking at the launch of Lucinda Creightons new party. From the 2011 General Election Campaign a “Twitterfesto” produced by The Green Party. 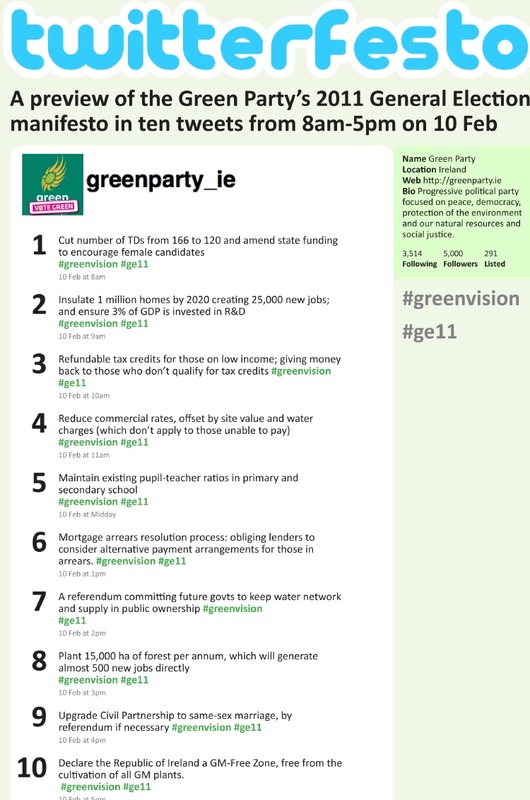 It was a preview of the Green Party’s Manifesto in ten Tweets. From the 2011 General Election a leaflet from Direct Democracy Ireland candidate Raymond Whitehead, who was running in Dublin South. Whitehead polled 120 votes. 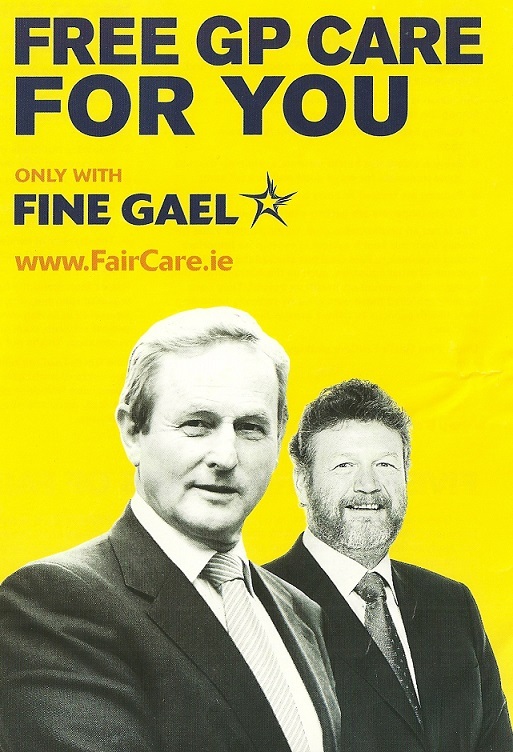 From the 2011 General Election campaign (or possibly slightly before it) a leaflet from Fine Gael outlining their ‘Fair Care’ plan on Health. The headline is “Free GP Care For You only with Fine Gael” and at the end of the leaflet are various targets and time frames that they will be met with ‘Fine Gael in Government’. 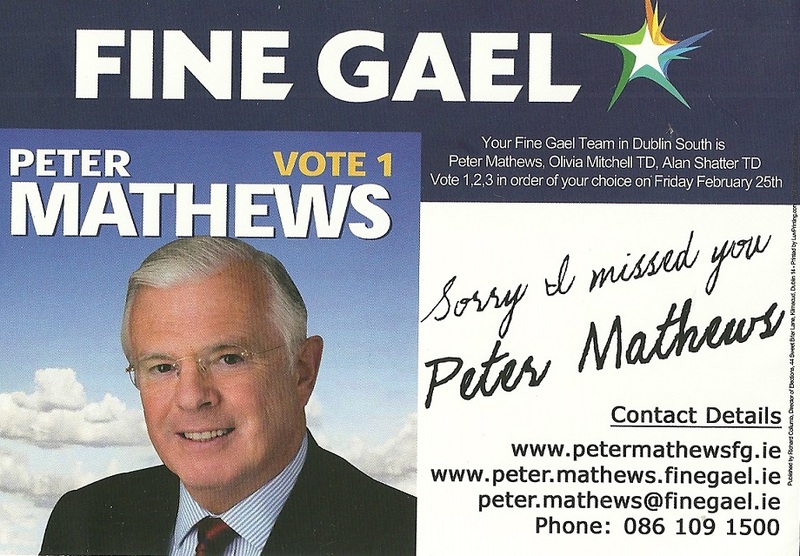 From the 2011 General Election a simple ‘Sorry I Missed You’ card from Fine Gael Dublin South candidate , Peter Mathews. Mathews was elected and has since lost the whip. From the 2011 General a leaflet from Tom Sheahan who was running for Fine Gael in Kerry South.Sheahan was was elected a TD in 2007, lost his seat in this 2011 General Election. He was however elected to the Seanad on the Administrative panel. 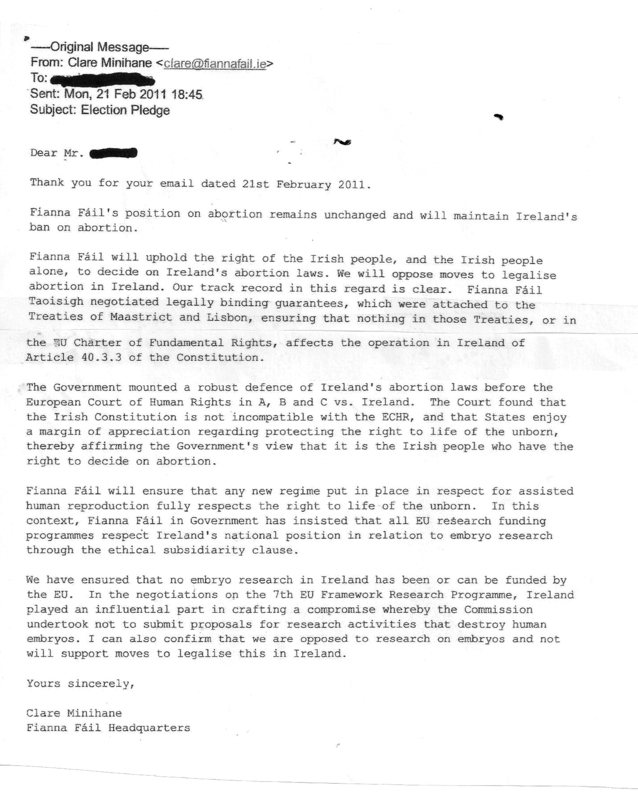 From the 2011 General Election a copy of an email from FF HQ to a member of the Pro Life lobby about their intention not to legislate for Abortion in Ireland.